If Apple's mythical tablet is real-and given the spate of rumors from multiple sources, it certainly appears to be -- the device could be a natural-born book reader, ready to compete with Amazon, Sony, and soon Barnes & Noble in the burgeoning e-book market. In fact, "compete" may be too soft a term. Apple could easily clean its opponents' clock. 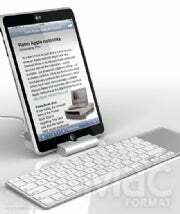 It could quickly dominate e-books much as it conquered e-music with the launch of iTunes in 2003. This is a concept image of a Mac tablet by MacFormat and is illustrated by Adam Benton. Yes, it's time for a boilerplate caveat. This is sheer speculation. My assumptions are based on what we've heard about the Apple tablet, and on what many users see as shortcomings of the Amazon and Sony e-readers. First off, let's assume the tablet -- or at least the larger version of it -- has a 10-inch backlit display, wireless broadband, a touchscreen, and a Web browser. If so, it would provide a better ergonomic experience than the Amazon Kindle 2, which lacks backlighting and a touchscreen. Let's also assume the tablet's display will have a higher screen resolution than the Kindle's 600 by 800 pixels, and that it'll do a better job of managing PDF files. Add it all up, and the tablet is a better user experience, excluding battery life. It's highly unlikely that Apple's multifunction device would outlast the Amazon or Kindle reader in that competition. What about the Kindle DX, Amazon's larger e-reader with a 9.7-inch display? It suffers from many of the Kindle 2's shortcomings, and seems more like a niche player destined for the education/textbook market. And the Sony Reader? Well, it's improving rapidly. The Reader Touch Edition has a 6-inch touchscreen; the Reader Daily Edition has AT&T's 3G mobile broadband. But like the Kindle, the Reader is essentially a single-use appliance. And with prices ranging from $200 to $400, it's a fairly expensive one at that. While reports indicate the Apple tablet may cost more -- probably in the $600 to $800 range -- it'll do a lot more too, perhaps even double as a notebook PC. To me, Apple's biggest advantage in the e-book reader market would be the versatility of its tablet. Given a choice between an Apple tablet as described above, a Kindle 2, and a Sony Reader Daily Edition (the one with built-in 3G), I'd be willing to pay a little more for the tablet. Will Apple enter the e-book market? We may find out as early as next month.